You won't find this unique piece anywhere else! Bespoke curated Rose Gold / Blush hanging wall mirror is the ultimate decorative accent for the rose gold enthusiast. Perfect for your modern farmhouse, chic cottage, or eclectic bohemian decorating themes. 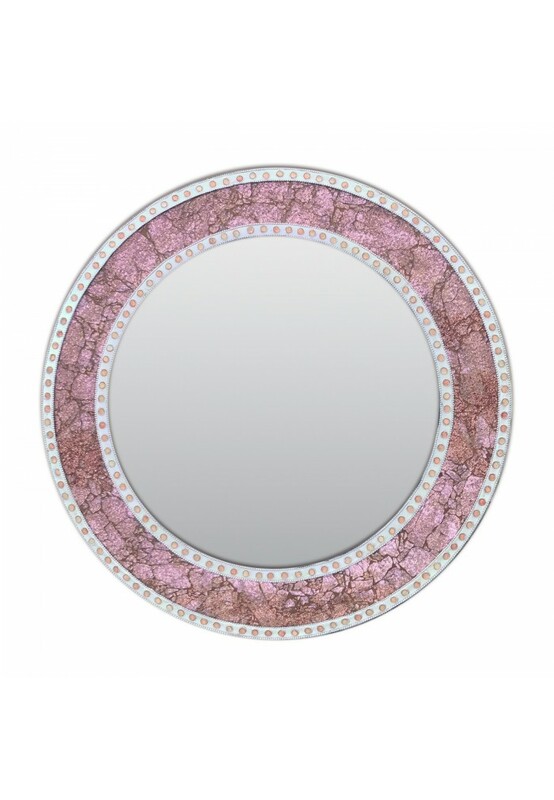 This handmade crackled glass mosaic wall mirror adds elegant touches of refined style to any room or wall. 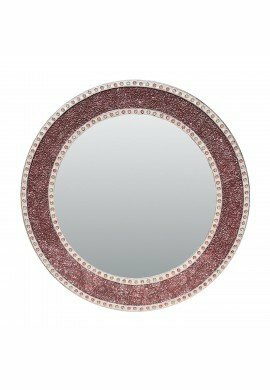 Durable wood frame contruction ensures this unique 24 inch round wall mirror reflects the beauty of your home decor for years to come. Crackled Glass Mosaic Tiles are hand laid for an authentic look that cannot be replicated. The mosaic frame provides the perfect glittery splash of color to match existing decor or provide that pop of color. However, make no mistake, this artisan mirror is perfectly capable of making a design statement all its' own. Wall mirrors are usually just that...wall mirrors. 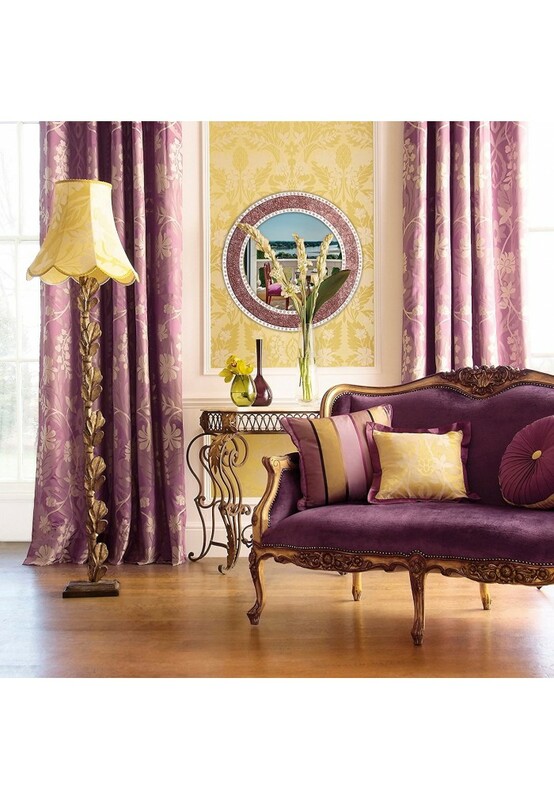 We pride ourselves on designing functional pieces of art with unique style and in hard-to-find interior colors. The peachy, blush colored glass mosaic frame is accented with delicate rose gold colored glass beads and a cream-colored border. 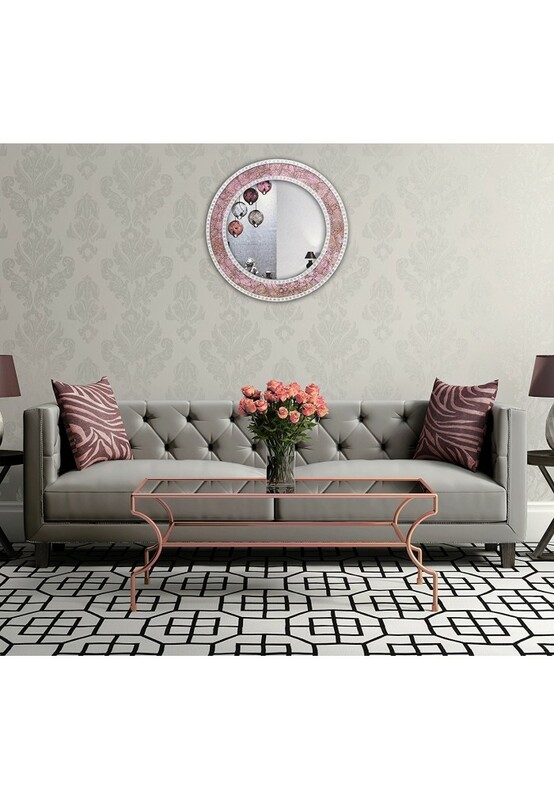 This mirror cheers up your living room, bedroom, bathroom, and entryway. Also works very well as a powder room mirror, a dorm room mirror, or as an over the mantel mirror. 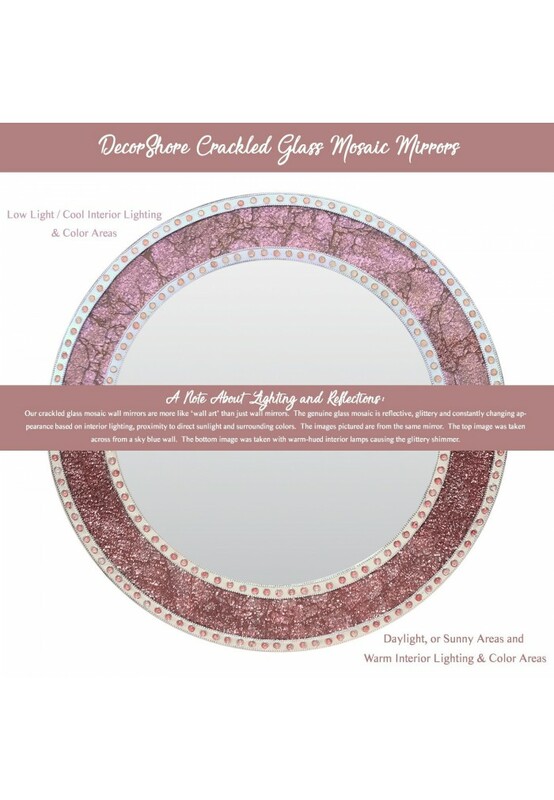 Artisan Handmade Rose Gold Accent Mirror Lends Reflective,Opalescent Colors to interior walls. 24 Inch Crackled Glass Mosaic Frame Surrounds Stylish 16 inch Mirror. Inner mirror can be removed from the back for easy cleaning or replacement if necessary. Recessed mounting hook on back of mirror ready to hang using your choice of hanging hardware (hardware not included). Perfect for a Variety of Décor Styles Including; Cottage, Farmhouse, Bohemian, Eclectic, French Country, Glam, Contemporary, Romantic Chic, and so many more!